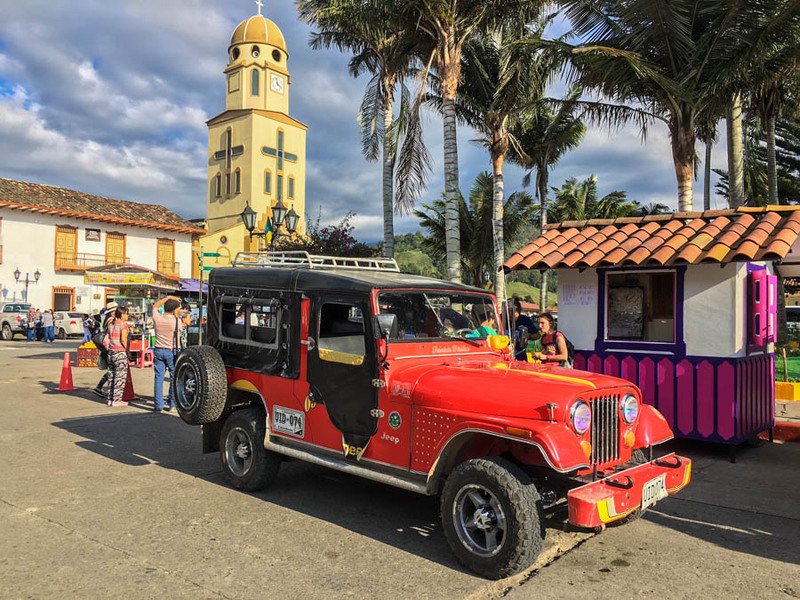 As coffee lovers, it was a no-brainer that Salento in the Quindío region of Colombia should be firmly planted on our Colombian itinerary. 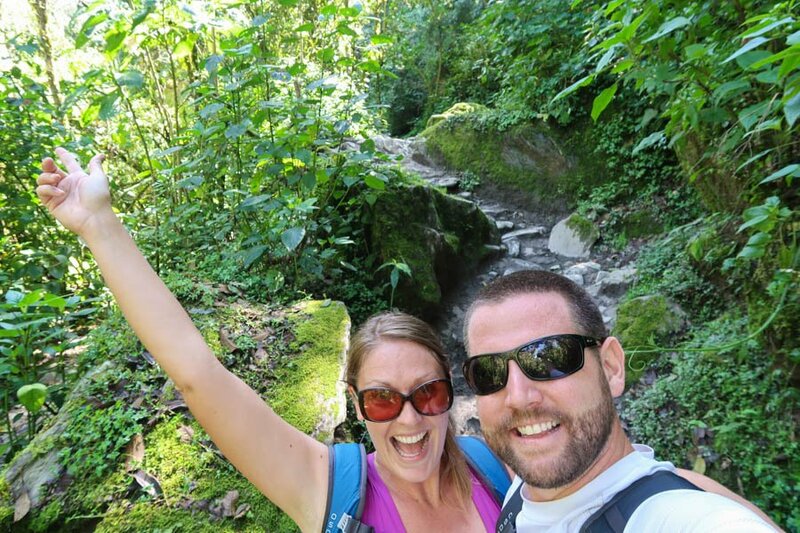 After one week in the bustling city of Medellín, we were ready for some peace & quiet in the mountains, and Salento sounded like it would hit the mark! 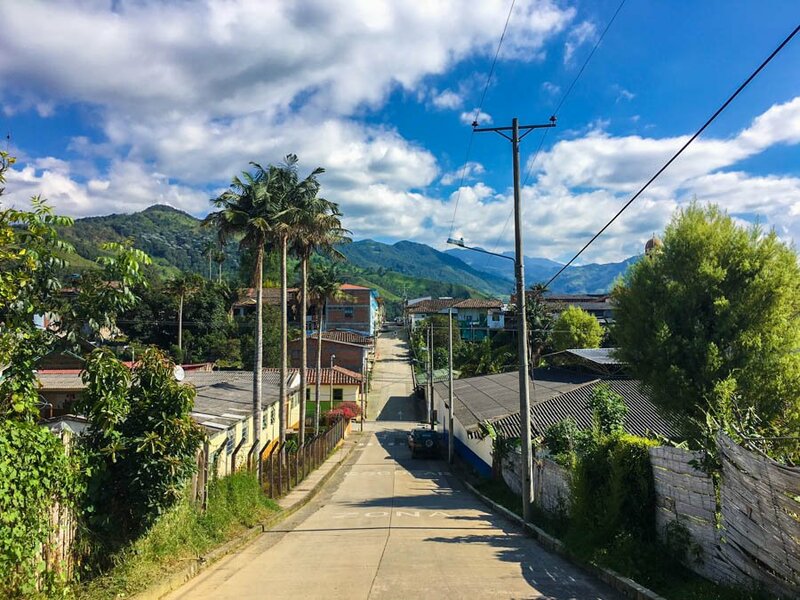 This was our first bus journey in Colombia and thankfully, it was a positive one. Our minibus pulled up at the station and we hopped in. The seats were leather, there was enough leg room for someone who was 7 feet tall and there were plug-ins at every seat! Did this bus ride really cost only 42,000 pesos ($13) for a 6.5 hour journey? Our luxurious minibus pulled away and we weren’t dreading the ride to Salento whatsoever. We zigged and zagged through the mountains, alongside a rushing river and enjoyed the gorgeous countryside. As soon as we arrived at the “terminal” (aka, side of the road) in Salento, the rains came. Together with two other backpackers from Sweden and the Netherlands, we waited underneath an awning before braving the walk to the main plaza. The common mode of transport in Salento are “willys”, which are basically shared jeeps. We found a bright red one, and the four of us hopped in the back. We bumped and bounced along the dirt roads towards La Serrana, the farmhouse-turned-hostel that we were all staying at. Note: I’m going to rave about this hostel, but we weren’t paid to say anything about it, and we didn’t get the stay for free! We paid for our 7 nights just like anyone else 🙂 You can read our review here. Mother Nature was on our side. 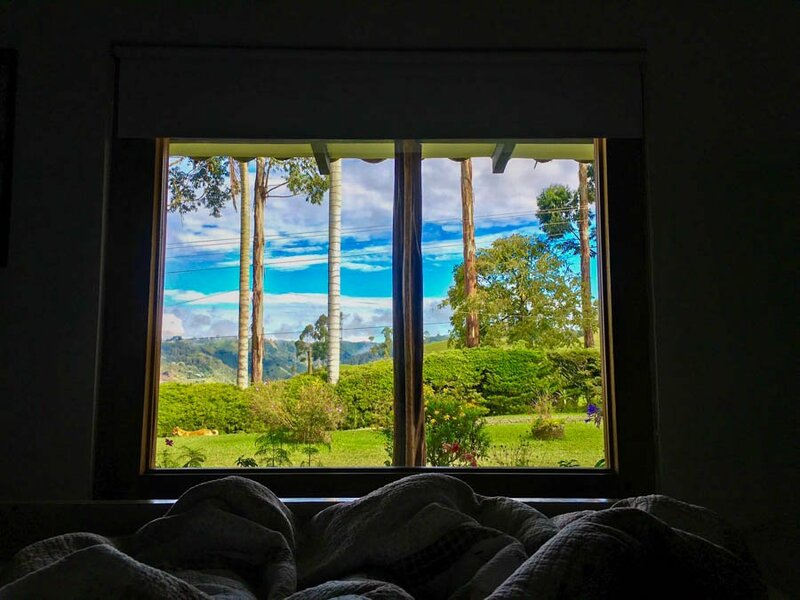 As soon as we met the receptionist, and handed in our passports, the clouds started to part and we saw the farm for what it truly was: paradise. The hostel was set on a mountain, and was surrounded by even higher mountains, with mist hanging in the valley down below. There were cows, dogs, birds and endless amounts of trees. 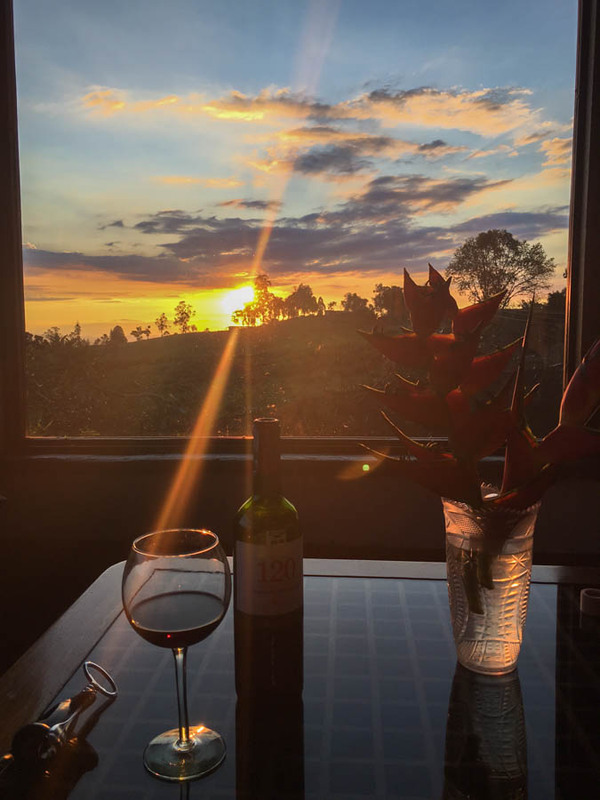 This place was incredibly peaceful and as soon as the staff opened the door to our private double room with fireplace and mountain views, we knew we made the right choice in deciding to spend a week here. 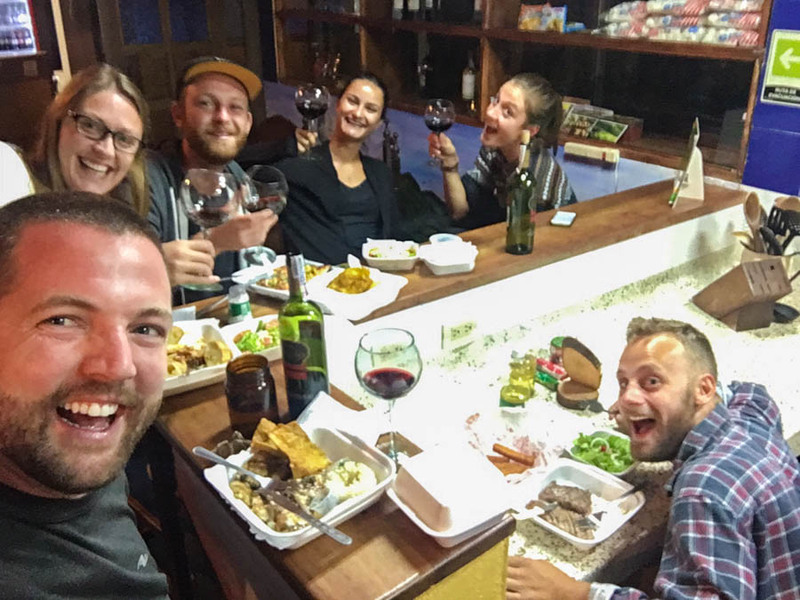 The hostel was the ultimate place for meeting like-minded travellers and we enjoyed many nights sitting around the common area chatting over a bottle of wine, and going out for dinners and tejo (a traditional Colombian game played with gun powder and metal discs). Directly next to the hostel was a dirt road which led to a few of the coffee farms in the area. Rather than hiring a jeep, we opted to walk and enjoy the fresh air while the rain held off. About 30 minutes later we arrived at Ocaso farm and joined the small group to learn about the process of growing, harvesting and brewing coffee. We were put to work and collected some berries from the plants – red and yellow meaning they were ready to be picked, green if they weren’t. The whole process was very interesting, yet depressing at the same time. 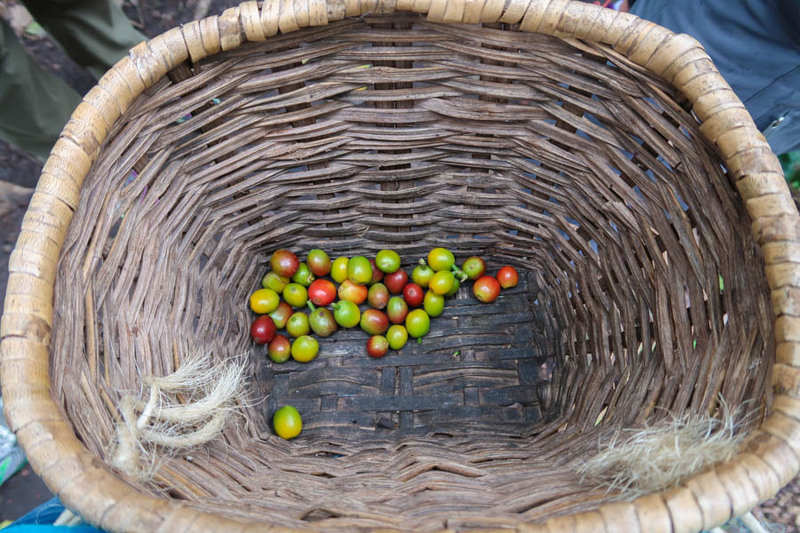 The people who pick the berries from the plant earn 500 pesos ($0.16) / kilogram and they can do about 100 kg / day, which means they can earn $16 / day for their hard work. The women who sort through the “good” coffee beans vs. the “bad” ones, earn 5,000 pesos ($1.63) per 70 kilogram sac of beans. They can fill 4 sacs in a day, meaning they can potentially earn $6.50 for their work. Hearing these figures made us really appreciate each cup of coffee we’ve had since. 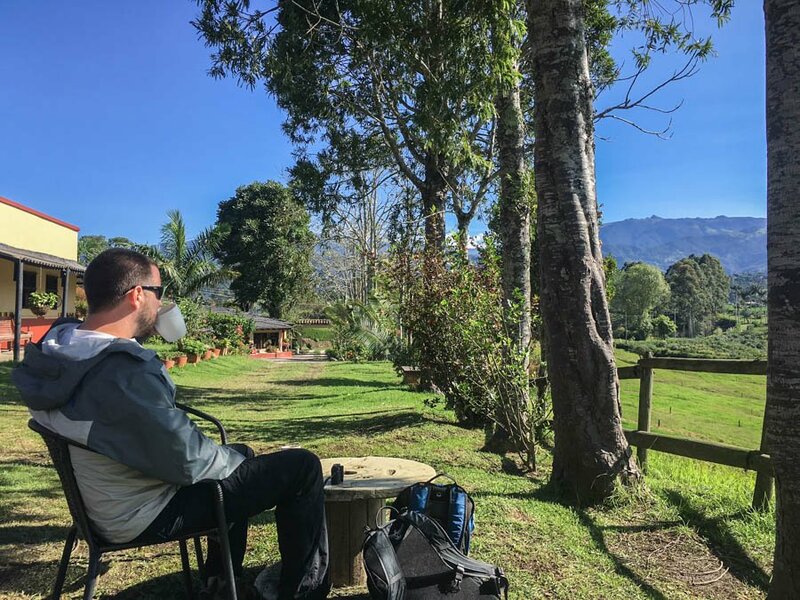 Enjoying a cup of coffee at La Serrana Hostel – look at that view! Salento itself is a quaint, colourful, colonial town. And as with most Spanish cities and towns, there is one main plaza with a church! There’s a pedestrian street with a few boutique clothing shops, many cafes and some (very good) restaurants. 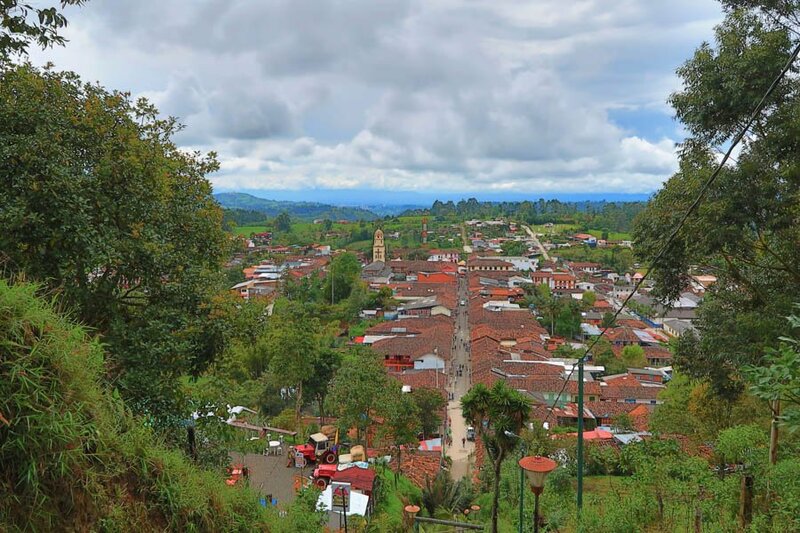 We climbed up the 200 colourful cement stairs at the east end of town to the Alto e la Cruz, El Mirador (viewpoint) and were rewarded with views over rooftops and to the mountains beyond. This is where we met up with Carlos and Andres, two guys from Bogotá who had cycled to Salento over the course of 4 days. They asked us if we had tried patacones yet, and when they heard we hadn’t, they immediately invited us to join them for lunch. 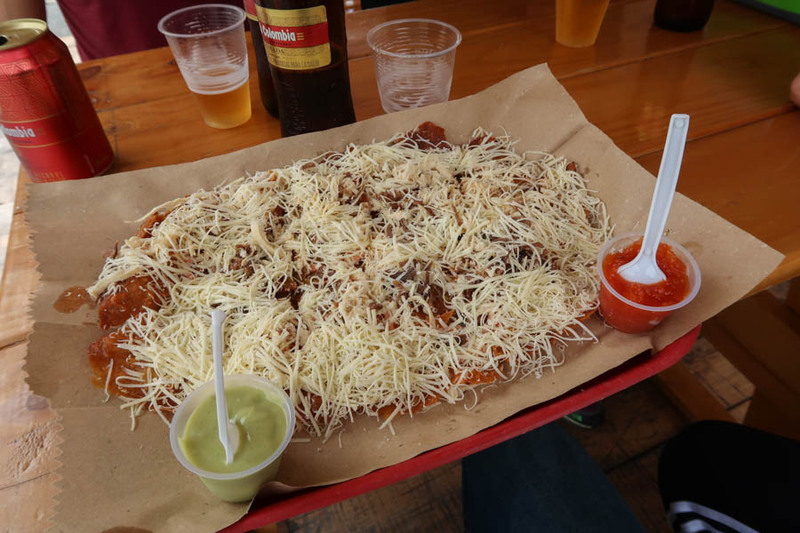 Both the company of our new friends and the fried, flattened plantain dish with cheese and numerous sauces were fantastic. Andres and Carlos insisted we call them when we arrive in Bogotá a few days later, and we swapped contact details before parting ways. 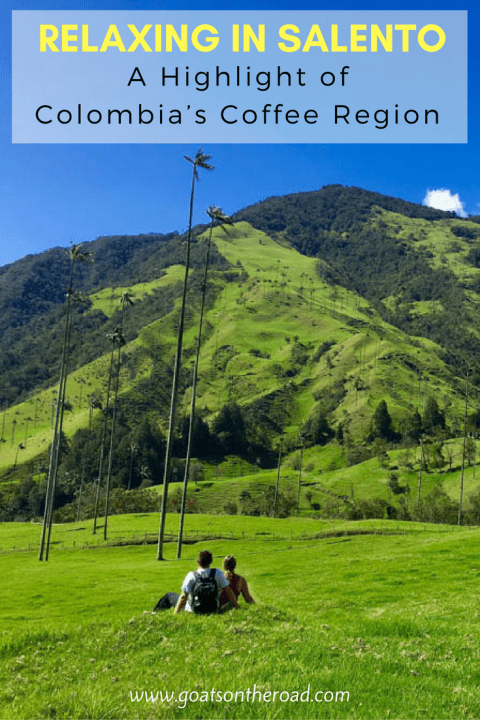 Our main reason for travelling to this area of Colombia was to hike the Valle de Cocora, which is a trek that showcases the Wax Palm Tree – the incredibly tall, national tree of Colombia. With the on-and-off rain showers, the conditions for the trek weren’t ideal. Hikers returned to the hostel covered in mud, and complaining of not being able to see the views (one couple even got lost!). Luckily for us, we had 8 days in Salento and on day 5, we awoke to bright blue sky! This was the day to do the hike. We headed up to the trailhead in a shared jeep and pulled out our “map”, which was just some handwritten instructions from our hostel. We chose to do the full loop, which would have us ascending 1000 meters, and would take about 5.5 hours. We weren’t even at the “star” of the hike yet and we were already in awe of the nature that surrounded us. The air was fresh and crisp, the ground was almost dry and the sights were outstanding. 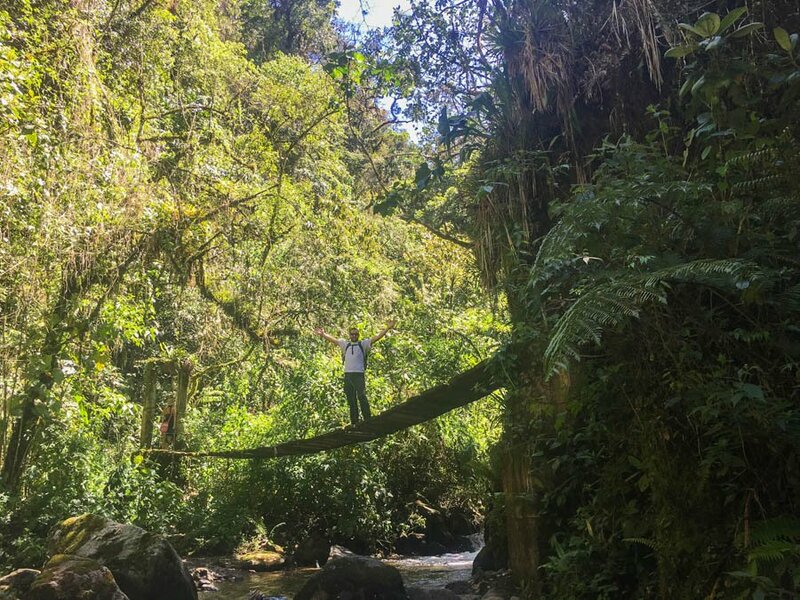 We crossed more than 5 rickety wooden suspension bridges and passed by a couple of waterfalls before starting our steep ascent. The suspension bridges were pretty rickety, good thing they weren’t that high up! We huffed and puffed and stopped a few times to catch our breath. It was actually quite a tough climb and we passed numerous hikers sitting down to take a break. Once at the top of the strenuous hill, we arrived at “La Montaña”, which is a home at 2,860 meters offering expansive views down the valley and across to a towering mountain. This vista was already a highlight of the trek, but the best was yet to come. After descending for about 15 minutes, we arrived at a bench with 2 horses next to it. The setting of this bench could not have been more perfect! We sat there and waited for a hiker to take our photo – it was too good to pass up. Finally, towards the very end of the trek, we saw them. Gigantic, narrow palm trees dotted the valley floor. They were so surreal looking and seemed completely out-of-place, but there they were! These trees were unlike any we’ve ever seen. After gawking at the cartoon-like wax palms, we hiked the final stretch towards the jeeps to take us back to Salento. 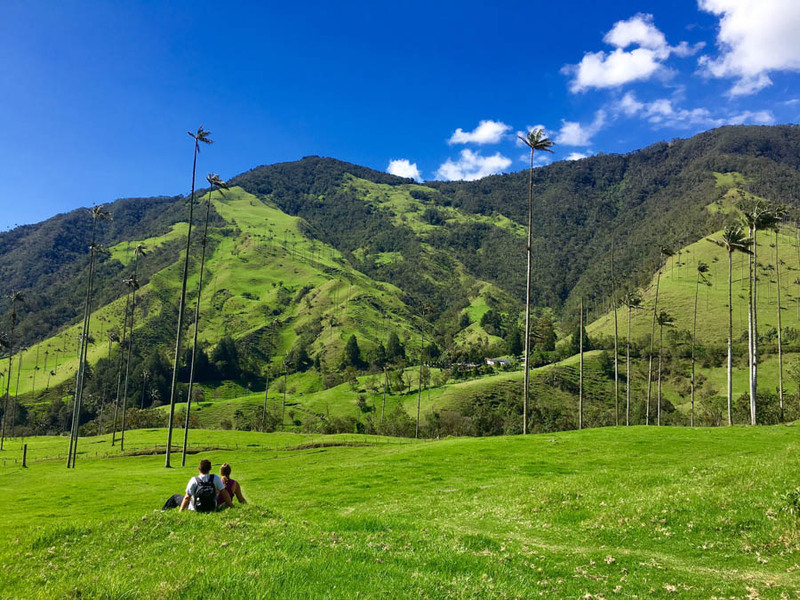 The Valle de Cocora was an adventure we’ll never forget. 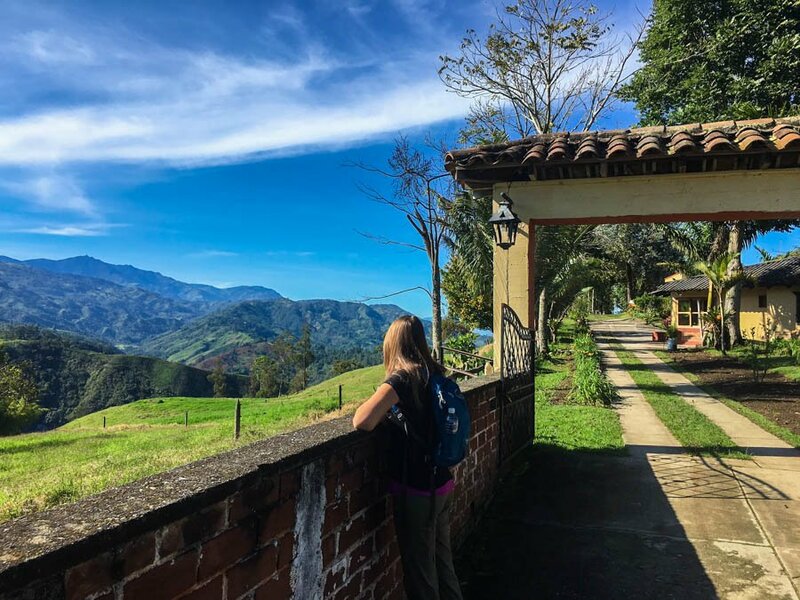 Fellow travellers came and went during our 7 night stay at La Serrana, most of which wished they had more time to spend in the tranquil setting that the hostel and surrounding area provided. 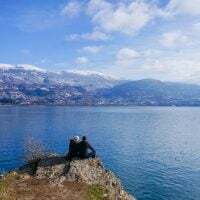 We’re so grateful that although we could be travelling at a faster pace, we both prefer to move slowly and really try to digest the destinations that we visit. 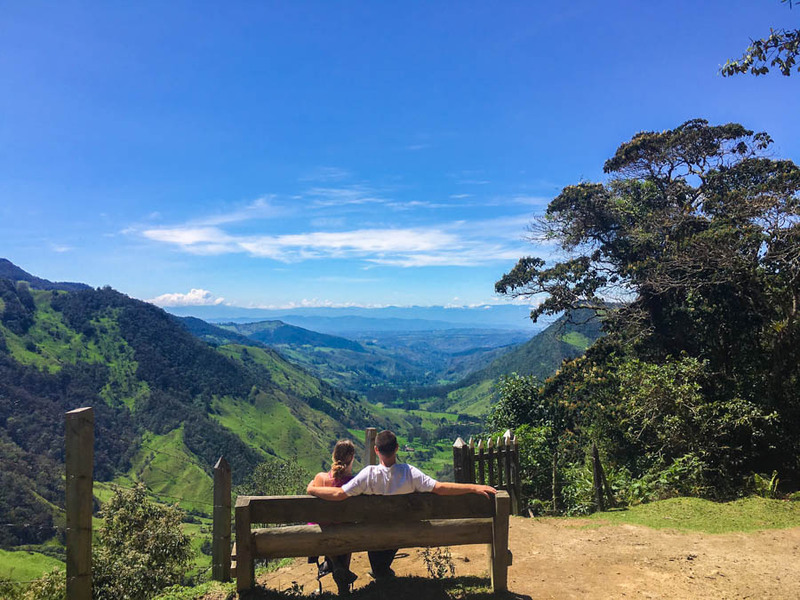 We could have stayed much longer in Salento, but we decided to pull up our roots and make our way to the big city of Bogotá, the capital of Colombia. Check out our video of Salento! Book your minibus from Medellín to Salento at Flota Occidental counter #13 at the station a day in advance. Buses run at 9:00am, 11:00am and 1:00pm and are 21,000 pesos ($13) each. “Willys” from town to La Serrana Hostel are 6,000 pesos ($2) each, no matter how many people. Eat at Brunch, BetaTown, El Rincon de Lucy, Restaurante Aquí Me Quedo and Luciernaga. La Serrana is the best hostel we’ve ever stayed at (we didn’t receive a free stay, and we didn’t get paid to say this! ), we loved it. They have a wide variety of rooms ranging from dorms for 30,000 cop / night ($10), to our room which was a king room with ensuite bathroom and fireplace for 135,000 / night ($44). You can also camp here. A big breakfast is included, the staff are very friendly and the they have nightly dinners and bonfires. 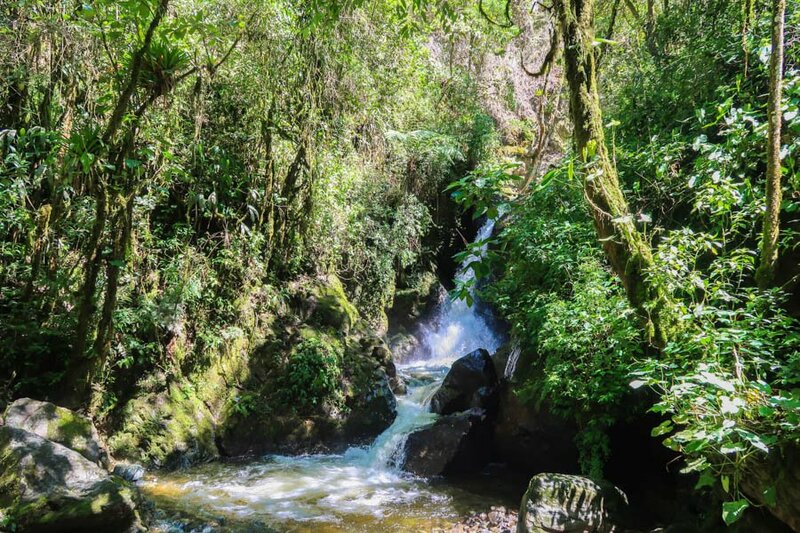 A Willy from the main plaza to the trailhead of the Valle de Cocora costs 3,600 cop / person ($1.17). 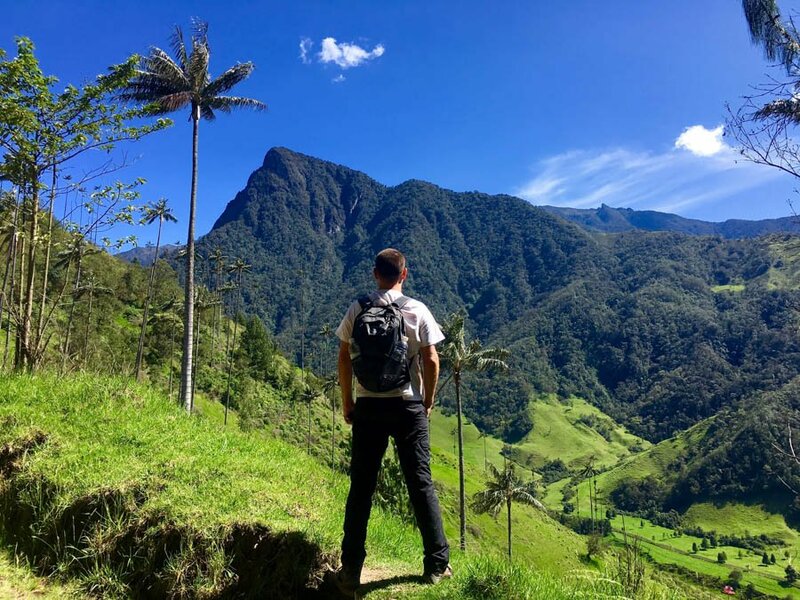 We recommend doing the longer loop of the Valle de Cocora, as opposed to just a quick hike to see the main wax palms and returning the same way. I must be so happy spending my time in Salento. I’ve never been to that place but I find it stunning. I must visit this place. Sounds like your stay is quite amazing. Those pictures are amazing, and you certainly sell the place, especially the hostel. It looks like parts of Indonesia, or even the northern coastal mountains of New South Wales in Australia. 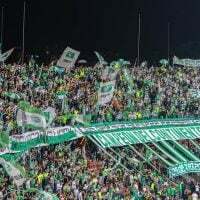 You’re really making me want to go to Colombia now!!! So you know…. you want a great coffee ? you don’t pick the green. A HUGE thank you for all those informations, very useful !